Designed for feeding fish. Molded of non-toxic polypropylene plastic. 1 liter volume. Color may vary. No power is needed to drive the belt, making this feeder easy to use anywhere. Excellent for use in remote areas. Feed is slowly and evenly released for faster growth, healthier fish and lower mortality rates. The German wind-up clock mechanism drives the feeding belt. 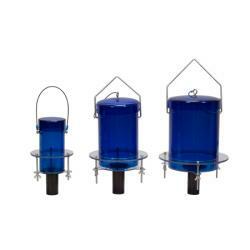 The feeder is constructed of weatherproof corrosion resistant high impact plastic with a stainless steel cover and inner components. It is very simple to use. Simply pull belt back and the clock automatically begins functioning. Spread the desired amount of feed over the belt surface and return the next day to repeat the process. 12 or 24 hour clock models available with either 3 kg or 5 kg capacity. Availble in either 12 or 24 hours. 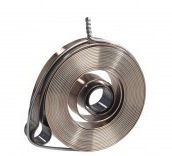 Includes screw, nut and cap nut for mounting clear clock or black spring covers to belt feeders. 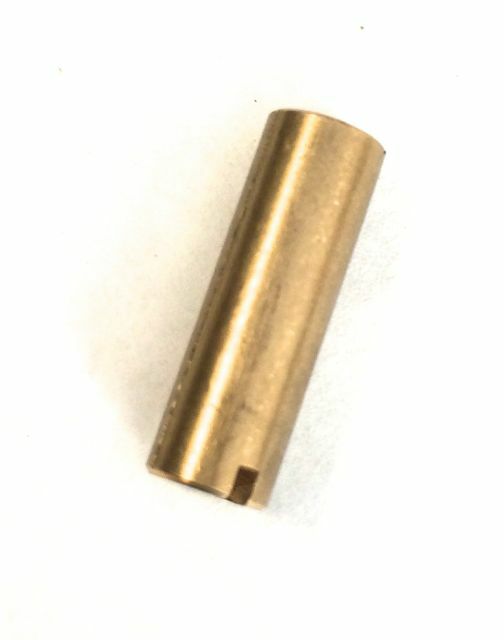 Brass screw for mounting belt feeder clocks t0 feeder body. Belt Feeder Drive Journal serves to connect tension spring and drive shaft. Belt Feeder Drive Journal serves to connect clock unit and drive shaft. The Eagar Fry Feeder is designed to allow small amounts of feed to be dispensed at regular intervals. By feeding small amounts more often, the fry progress is faster and healthier with less stress. The Eagar Fry Feeder is also easy to install over troughs or circular tanks. 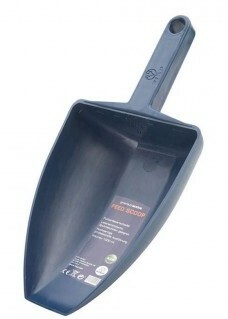 The feed amount is determined by an adjustable feed selector disc on the bottom of the feeder. The Eagar Fry Feeder comes with a standard 6 ft. cord. If desired, feed intervals can be controlled with timers. Automatic electric feeder. Once-a-day feeder for small ponds. Flake food or pellets are dispensed slowly over several hours each day (adjustable quantity and feeding time). 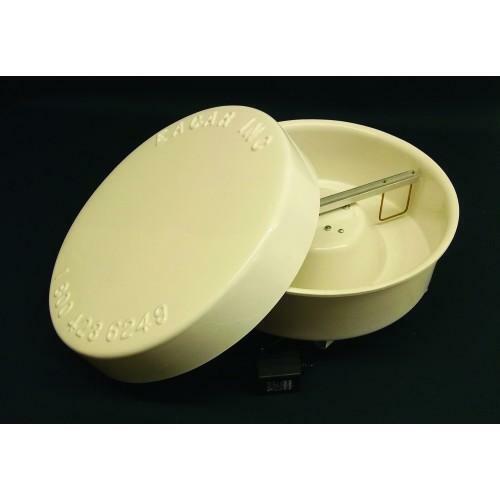 This feeder can hold close to 2 cups (approximately 200 grams) of food. Fully weatherproof, it can be mounted on a pole by the edge of the water or suspended over the water. One AA battery (not included) required for quartz-timed motor. Measures 7" x 7" x 3.5". The Aqua Chef will automatically feed your fish up to three times per day, and a manual override button allows immediate feeding with the press of a button. This aquarium feeder has a programmable, digital timer with a large display. Its patented design keeps moisture from spoiling the feed while also mixing and crumbling at each feeding. Dispenses flake, pellets and even crumble. Hopper measures 2" deep x 3" dia. and is 0.25 liter in volume. Includes a mounting bracket, double-sided tape and two AA 1.5V batteries. One-year warranty. Benefit from highly accurate feeding rates and times with these vibratory feeders. They easily handle almost all different feed types (even extremely fine and moist feeds) and they are resistant to clogging from even the oiliest feeds. Perfect for applications where multiple accurate feedings per day would otherwise require a lot of manpower, such as in a hatchery. For each feeder, use a 12VDC adapter such as the SF51 for 115VAC operation. You will also need a timer. We suggest either the SF44 for 115V, the SF41 for 12 Volt. One timer can be used for up to 13 feeders (all connected feeders will feed at once). One-year warranty. Variable power supply that converts AC to DC, used with AVF6, AVF7 and AVF8 feeders. Six voltages can be selected, (3, 4.5, 6, 7.5, 9, 12), the higher the voltage the greater the feeder vibration. Each AVF6, AVF7 or AVF8 feeder requires an SF51 to provide power and vibration level. The SF41, premium timer, with an SF40 converter box, this allows the timer to be used in a 117/120 volt AC operation. Primarily used with AFV6, AF7 or AFV8 feeders. AC output from the standard receptacle on the rear of the unit is good for most equipment drawing 15 amps or less. 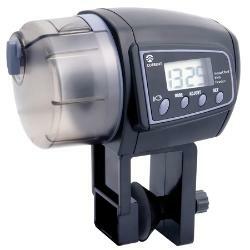 The SF41, premium timer, has over 97% reliability. Can operate a 12 volt system. Easy to program and provides multiple capabilities. Used with the AVF6, AVF7 or AVF8 Vibratory feeders in a DC operation. Controls the vibration intensity of these feeders. Each feeder is required to have an SF62. These screw style feeders are used throughout the world in commercial aquaculture facilities. They are very well built, durable and can be used both indoors and outdoors. 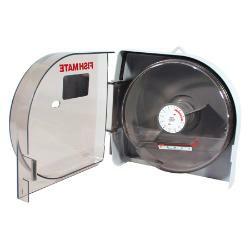 Designed for highly accurate dispensing of feed, they feature a rheostat that can be set for both speed and duration. FS4059 weighs 5 lbs. Screw feeders are 12V and draw approximately 0.5 Amps. A power supply and time controller are needed but not included. • One to four FS4050 screw auger feeders with Spreader. • One to eight FS4059 screw auger feeders. • One to eight FM4480 vibratory feeders. The controller is set to handle up to four feeders; however, the optional "Y" cable expands the capability to eight feeders (four "Y" cables would be required for eight feeders). 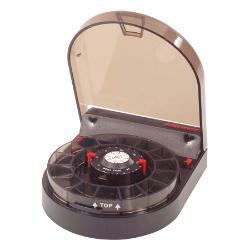 The timer features safe 12V operation and is housed in a moisture-resistant, ABS plastic case. Feeders connect to the feeder time controller with cables available in 2 wire lengths. No soldering or crimping, all components are interchangeable. Only one power supply is required for powering up to eight feeders. One-year warranty. Deluxe: Up to 24 feedings per 24 hours, adjustable from 1 to 99 seconds per feeding. Batteries not included...or needed. The unique twist-lock lid is wind- and varmint-proof on these high-quality, UV-resistant, polyethylene hoppers. All four sizes have the same pendulum demand feeding mechanism for #4 crumble to 1/4″ pellets.